So... who ya got, Gumbie? Vontaze Burfict's dog would have just bitten him in the head to save time. Laremy Tunsil is the presumed Titans pick at #1. MMQB had an article on him today. Jared Allen could have waited for the sky to clear up in a couple days to make the symbolism work. That article was humorous to me. Who doesn't know the name? Surely not anyone who follows college ball, since he was the epicenter of the investigations at Ole Miss. That makes sense, even if it'd be a lot cooler if they went crazy with a RB. The local St. Louis sports forum is discussing what kind of games they can expect to get on Sundays, with the Rams gone. I think that the Chiefs want to claim the state, becoming the local team for St. Louis, which is what I am hoping for. There are plenty of Chiefs fans in town because there are so many transplants from across the state. Plus, The Chiefs kind of dominate the entire state now. Apparently Indianapolis has been trying to lure Rams fans over to the colts, and Indy is not a bad drive from St. Louis. Google maps puts Lucas Oil Stadium as eight minutes farther away than Arrowhead. But that is from my house, which is near downtown. The St. Louis market stretches pretty far west, so for many, KC will be even closer. When the Cardinals left, the word is that they broadcast all of their games before switching over to KC. Some are wondering if the same will happen wit the Rams, but I don't think so. This divorce was a lot more bitter. But I guess what I'm wondering is, what are the bylaws that govern what markets a team can protect? KC has said they want St. Louis, but are not going to market heavily for at least a year. It will turn off more fans than attract right now. And Hunt's lone vote for Inglewood as part of the committee might have been meaningless, but it did not go unnoticed here. What I'm really, really hoping for are Chiefs games on the radio here. Mitch Holthus and Lenny Dawson area fantastic team. They just sound like football. There is no word on a local affiliate yet, but I suspect its coming. Number one picks being the epicenter of investigations seems to be a recurring theme these days. In all seriousness it's no secret Tennessee is desperately trying to trade the pick. In my dream scenario they trade back and get Jalen Ramsey and a top 5 WR, but in all likelihood there's no must have QB's this year so I doubt anyone takes the bait. If no one trades it's most definitely Tunsil which I'm ok with. Jared Allen retired, for those who care. His best days were clearly well behind him. I love the Tunsil pick, because I love any pick that causes DEs to slide down the draft board. Here's hoping this is one of those years where the QBs have great combines and teams fall over each other to try to move up and draft them. 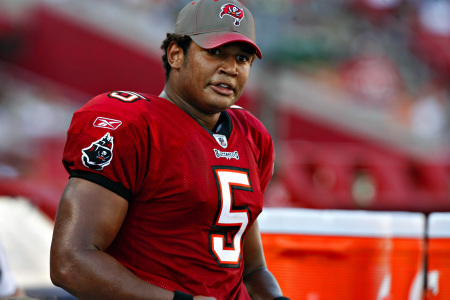 Tampa will never get a legit edge rusher. Geesh, now I want the Browns to draft Joey Bosa and wait on QB. Oh, I thought that was footage that Dean Blandino was going to use to explain new catch rules. Did he make a football play? This is the St. Louis trolling thread. Last year was the Milkman trolling thread. Try to keep up. Ramsey has all-­pro potential and traits, but could use a little more bravado and attitude play in and play out. Anyone who has watched more that 10 minutes of Ramsey's career would never suggest that he needs more bravado. Hell, there were a LOT of times where I wanted him to tone it down a bit, since he lived on the edge of an unsportsmanlike penalty on the regular. Pretty sure every thread is a Milkman trolling thread. St. Louis is just sad. Feh. None of those bother me. The Bert Emanuel rule was years and years ago, I am now immune. But I guess what I'm wondering is, what are the bylaws that govern what markets a team can protect? Every team has a "primary" market (their city and immediate surroundings). Some teams are assigned "secondary" markets by the league. These are markets outside of the primary market, usually adjacent. Orlando is a secondary market of Jacksonville's, for example. Oakland and San Francisco both get Sacramento to their north, and Monterey to their south. Kansas City has Topeka. Outside of the primary and secondary markets, the TV networks are the ones who decide what game they broadcast in what regions. St. Louis is probably sufficiently far from KC and IND that it would not be designated a secondary market to either team. That means it's in the hands of the networks what to broadcast. 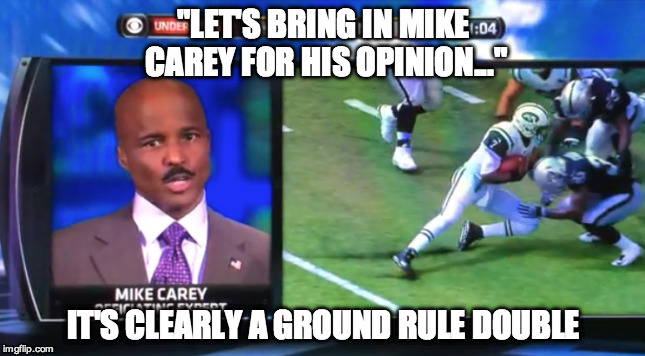 Clearly a catch and fumble, but Mike Carey thinks it's actually an interception. Bill Simmons has a new site coming soon called the Ringer. Handful of ex-Grantland peeps. No Barnwell or Mays. Failure. Them and Zach Lowe are probably under contract to ESPN. It looks like most of the Grantland people are the non-sports ones. Put Barnwell and Lowe and the baseball folk on an easy to access to website and I'll consume what they give me. Simmons was the least necessary of the group. He took two steps, turned and faced his tackler! Sometimes Barnwell strays to far into "math professor analyzing football" territory, and Lowe's salary cap analysis can be tedious, but I agree with you. Nah, Barnwell can stay weird with the maths, I'm okay with that. Mays won't be coming back, MMQB is a better gig than this will be, I'm sure. Simmons is the least necessary from a writing standpoint (never did bother with the podcasts), but he brought in a lot of really good people and took chances. That's what I'm hoping for here, even if Grantland will forever be known to me as my The National. I may not like Simmons but, from all reports, he was a fantastic boss. Did an excellent job of attracting skilled writer, built a very solid platform, and encouraged an enjoyable culture. If the new website is just Simmons featuring the popular culture parts of Grantland, I'm not interested. Heath Miller retires while the Rams release Chris Long, James Laurinaitis, and Jared Cook.